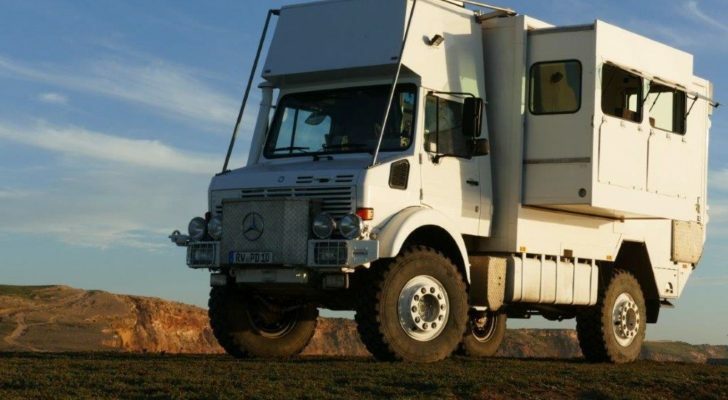 If you think you can’t afford to RV because you don’t have a camper or heavy duty truck, think again! 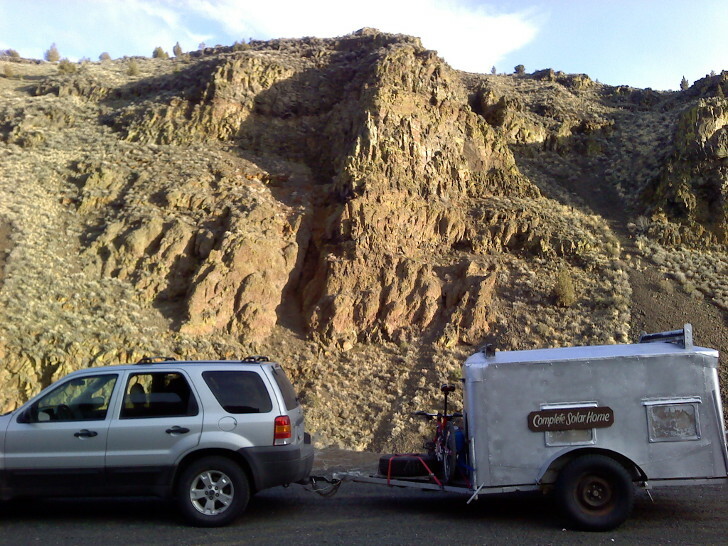 This cross-country traveler built his homemade DIY camper trailer on a tight budget using recycled materials. He pulls it with his sport utility vehicle. 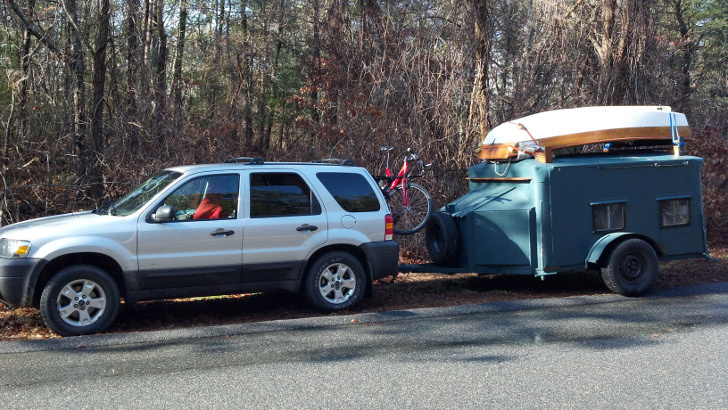 You don’t need a heavy duty truck to pull this homemade DIY camper trailer. The rebuilt trailer looks expensive but the owner, Carter Fleming, says that the body cost almost nothing to make. It was fabricated by attaching hammered aluminum sheets to a metal frame. The frame is bolted down to wood decking and the entire piece sits on a homemade trailer. The original owner never finished building the homemade trailer. 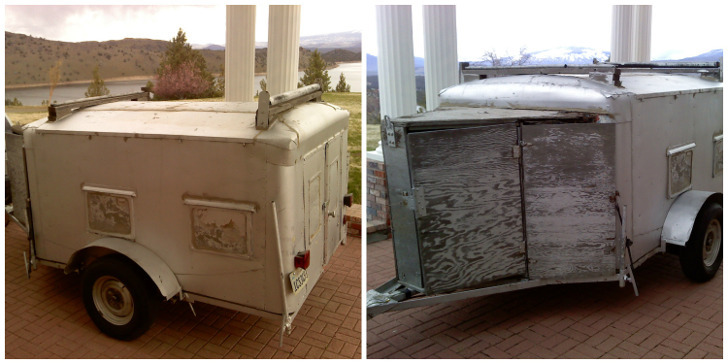 Fleming bought the beat up trailer from a DIYer who never completed the finishing touches – inside or out. He saw the potential of this shiny silver ‘Complete Solar Home’ and snapped it up. “It drew a lot of smiles and laughs on the road,” says Fleming. So Fleming bought it and set out to finish the job. 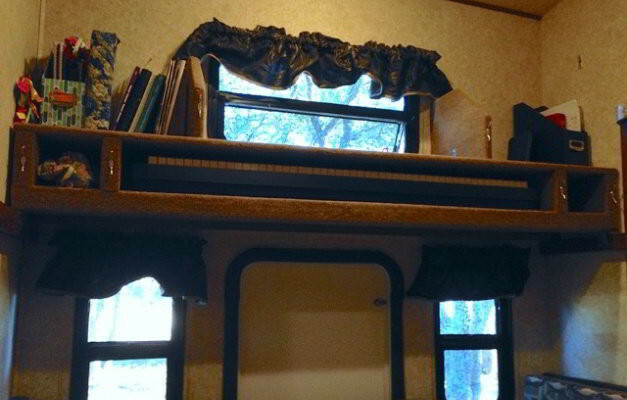 After hauling it from the west coast to the east, he spent the next ten months making it cozy. “I got sheets of rigid insulation and lined the inside, then threw down carpet pad and carpet,” he says. Recycled materials were a must. Fleming took plexiglass from an old screen door for the windows. 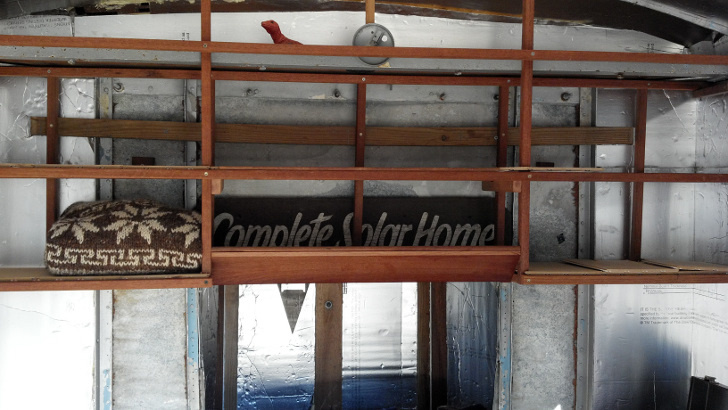 After adding mesh screens, he hung curtains and installed a solar-powered vent fan in the roof. 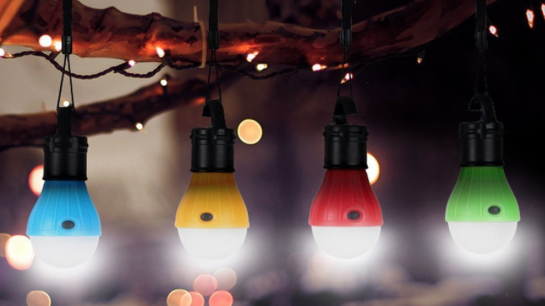 Recycled building materials add character and functionality. This isn’t a family-sized DIY trailer, but it’s big enough to fit a folding foam comforter bed that stores against the ceiling during the day. Fleming says he didn’t want to sacrifice comfort just because the trailer was small. As a bonus, “It’s got enough room left on the side for your dirty boots,” he says. Perfect for those muddy hiking trips! 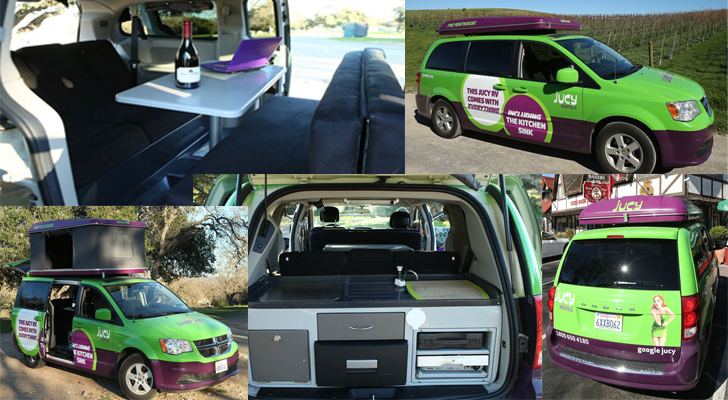 The camper trailer’s cargo areas hold more than you’d think. The most important part of the project? Making sure his faithful dog Leo had a good view. 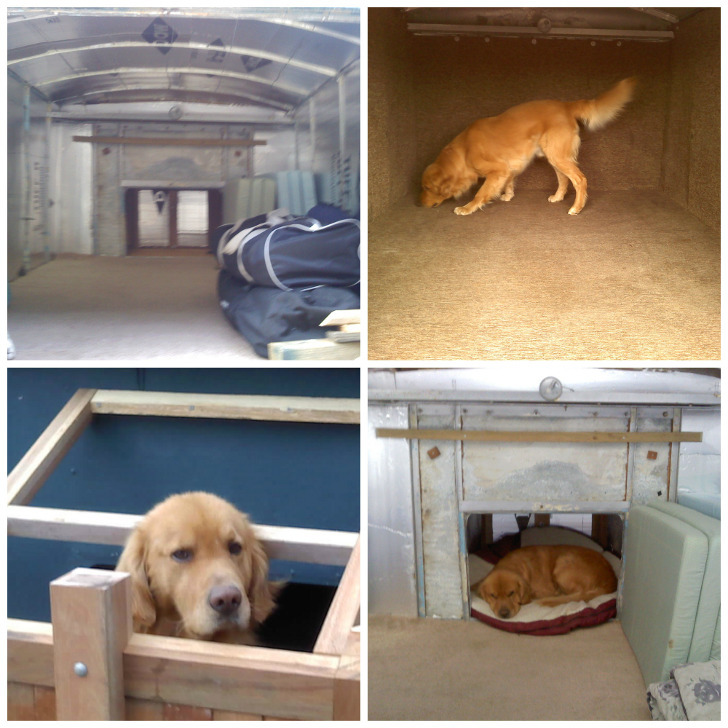 Fleming made the front window bigger so Leo can pass through to his custom doghouse that’s built onto the front of the trailer. Will the trailer pass the most important test? 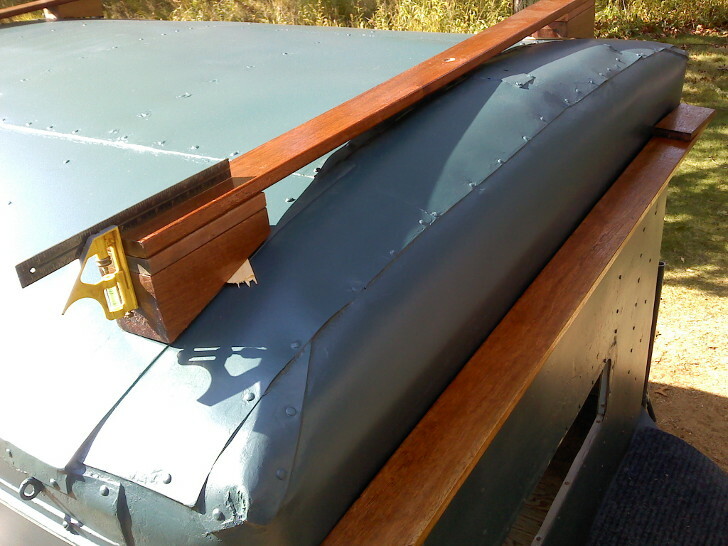 For storage, Fleming ripped off the existing roof rack and rebuilt it with mahogany wood. Inside he added simple shelves built with mahogany ripstock and leftover decking. He also designed a hinged, walnut shelf that folds down and out of the way. There’s one deep-cycle battery and a couple of 12 V sockets to power his appliances, including a 12V coffee maker. 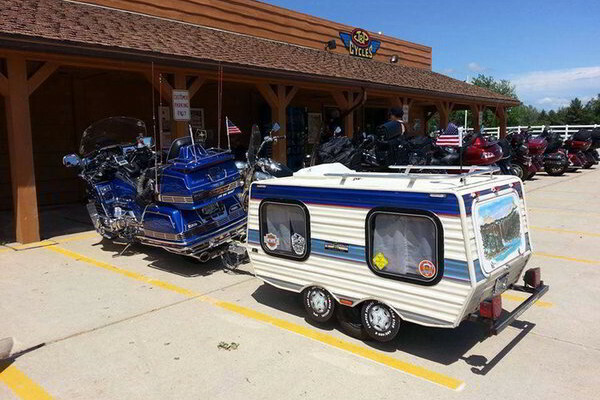 RV storage for all the basics, and then some! 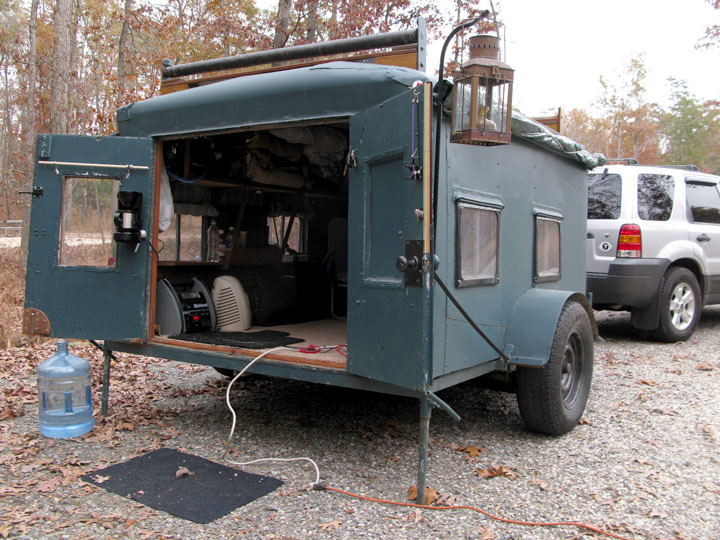 This cozy little homemade DIY camper trailer has come a long way from its humble beginnings. 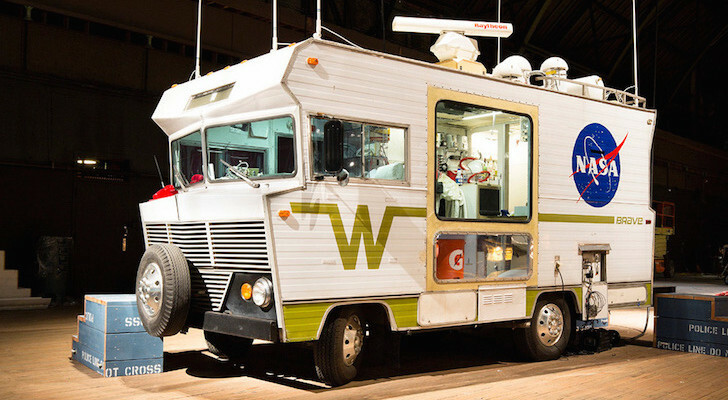 Less visionary people would never see its RVing potential, but Fleming did. 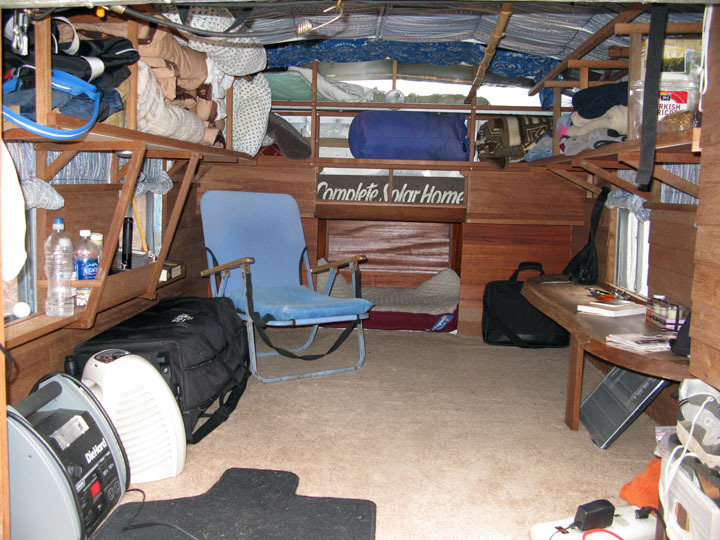 If you have your eye on a DIY RV rehab project, this RVer says go for it! Check out the side awning and lantern pole! The only obstacles to getting out there and making it happen are within ourselves. When somebody says ‘it can’t be done,’ take that as your personal challenge. UP NEXT: Homemade Super Light Teardrop Trailer Camper Towed By A Toyota Prius.